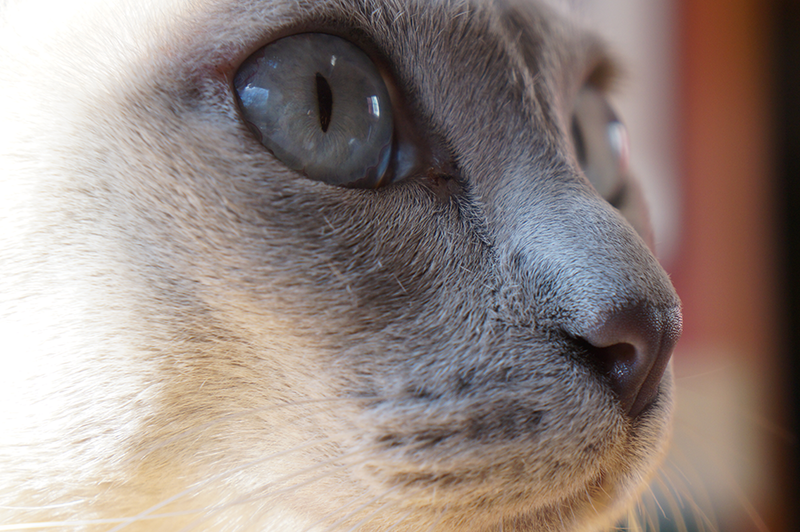 The intricacies of fur, nosepad and the detail of the eye. . .
After 4 pre-molars bit the dust, and his mouth was all stitched up, Faraday's a bit sore today. But the patient is resting well and we expect a complete recovery, much to Allie's dismay. Thanks ever so much for your kind thoughts and comments! That is good news. Onwards and upwards. Have a super Saturday. Poor Faraday - purrs for a speedy recovery! Poor baby, hoping he is feeling better soon. Beautiful photo! Feel better Faraday and best of luck with the Nose to Nose awards! Purrs from the Zee and Zoey Gang! Awwwww...soft paw for m'boys...and...and Allie too. Sending some preventative purrs for Allie.. cause you know they say these things come in threes..
That's a stunning shot! We're purring for Faraday's full recovery to be super quick! Glad Faraday is doing so well and great photo!!! Allie had better enjoy Faraday's downtime while she can! I'm glad to hear all went well. Hope Faraday makes a speedy recovery. That is a lovely photo. We're glad Faraday is home from his ordeal. Get well soon, buddy, and make sure the Tooth Fairy brings you something good for those teefs! Glad to hear Faraday is going to be okay.